This article is about the original theocratic empire. For other factions of the same name, see Covenant (disambiguation). "Creatures of the Covenant: the path is broad, and we shall walk it side by side!" They waged a genocidal campaign against humanity until they were defeated in December 2552. Despite being one of the most powerful military forces in the known Milky Way galaxy at the time, internal conflict combined with stubborn human resistance were formidable enough to shatter the bonds that held the empire together. This internal conflict broke the Covenant in two, forcing out the Sangheili species. While the Covenant Empire ended either during the Flood infection of High Charity or during the Battle of Installation 00, a number of new remnant factions, some of which maintain many of the ideals of the Covenant's religion as well as many of its former subject species, were created after the conclusion of the war. Some of the former separatists sought to recreate the Covenant entirely under Sangheili rule, free of the Hierarchs' influence. A splinter faction of Sangheili proclaimed to be a new “Covenant” was created by Jul 'Mdama; this smaller terrorist group was hostile to humanity, breaking the truce formed at the end of the initial war with the Sangheili Fleet of Retribution. Other hostile factions that utilize assets from the former Covenant Empire include Vata 'Gajat's faction, Merg Vol's faction, and the Banished. "The First Age: Ignorance and Fear. The Second Age: Rivalry and Bloodshed. The Third Age: Humility and Brotherhood. The Fourth Age: Wonder and Understanding. The Fifth Age: Obedience and Freedom. The Sixth Age: Faith and Patience. The Seventh Age: Journey and Salvation.''" — Maccabeus and the Jiralhanae of the Rapid Conversion. The Covenant created its own means of connoting time, comprised of "Ages." The Covenant's history is broken up into multiple occurrences of seven types of Age, each representing the predominant theme that occurred during those periods of time. These ages do not necessarily follow one another in order, nor are they equal in quantity. As an example, there were significantly more Ages of Conflict and Doubt than Reclamation. Each Age is further broken into what is called cycles. A cycle is the Covenant version of a day and it represents one artificial day on High Charity. A cycle contains approximately 265 units, which if translated into human time is roughly one hour of time on Earth. The construction of High Charity. At some point before the San'Shyuum encountered the Sangheili, the Huragok were found by the San'Shyuum in various M-series facilities. In 938 BCE, the San'Shyuum Reformists, aboard the Forerunner Dreadnought and the planetoid that would come to be known as High Charity, entered a Sangheili-occupied system that led to first contact between the two alien species. 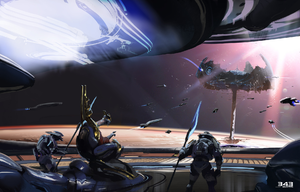 The San'Shyuum, who came to Sanghelios in order to claim and study the rich abundance of Forerunner artifacts left behind, soon found themselves sharing different ideologies of how such relics should be treated, which quickly devolved into conflict between the San'Shyuum and the Sangheili. The Sangheili believed that Forerunner relics were sacred and should not be touched, while the San'Shyuum Reformists believed that they should be studied and use them to make practical objects of their own design. The highly militarized Sangheili attacked the San'Shyuum almost as soon as their differences became apparent, and a war between the two species raged for eighty six years. At the start of the war, the Sangheili had a numerical advantage in terms of ships and soldiers. Their strength and military tactics were without peer. However the San'Shyuum's technology, gleaned from years of travel and study of their Forerunner Dreadnought, gave them the advantage in ship-to-ship combat. This proved to be the most common type of combat witnessed during the war. Eventually both species came to fear a very real threat: annihilation. The Sangheili feared it through the San'Shyuum's use of their unstoppable Dreadnought; and the San'Shyuum came to admit that if the Sangheili were this dangerous, there might be other forms of sentient life far more threatening to their race. The long and brutal war caused the Sangheili to violate their religious beliefs, studying and incorporating Forerunner technology in order to avoid defeat. This incorporation of Forerunner technology eventually caused a stalemate in the war against the San'Shyuum, however their Dreadnought remained unstoppable. Faced with this bitter reality, the Sangheili surrendered. With a proud tradition as warriors, the Sangheili held great respect for a worthy adversary, and after their surrender, the San'Shyuum sought to seek a burgeoning Covenant of the two races. In 852 BCE a tentative truce was worked out between the two species through the Sangheili leader, Pelahsar the Strident, and the San'Shyuum Breaking Shadow. The two agreed to forgive the past crimes of their species and began efforts towards an alliance. This eventually came about with the signing of the Writ of Union, a treaty that ended the conflict and brought about peace between the two factions. "Most of those we encountered in our search were compelled to join our Union. To take part in a movement that promised freedom for allegiance, salvation for service!" An Arbiter faces the Mgalekgolo in the Taming of the Lekgolo, prior to their successful incorporation into the Covenant. The conclusion of the conflict marked the First Age of Reconciliation, followed by the First Age of Conversion. This period was exemplified by the Covenant's expansion throughout the galaxy. In 784 BCE, the Lekgolo were encountered by the Covenant on Rentus, a natural satellite of the Lekgolo homeworld of Te. Upon the discovery that many of the Lekgolo worm colonies had literally devoured Forerunner artifacts and installations, a large-scale military conflict began. The Lekgolo initially proved difficult to defeat because of their ability to combine into the powerful Mgalekgolo, however due in part to their superior spaceship technology the Covenant was able to ally with the useful Lekgolo and the species was indoctrinated into the hegemony. In the year 1112, the Covenant discovered the Yanme'e, an insectoid race with an interplanetary civilization. First contact was violent as both sides took heavy casualties. However, it was the Covenant who fared worse in these battles. Ultimately, the San'Shyuum discovered a way to communicate with the Yanme'e, and subsequently incorporated them into the Covenant by way of a treaty. In 1342, the Covenant arrived in the Y'Deio system and encountered the Kig-Yar. Both Kig-Yar pirates and Eayn's militia joined forces in an attempt to fend off the Covenant military juggernaut. The war between the Covenant and Kig-Yar forces culminated in sieges of redoubts on the asteroids surrounding their world, however the asteroids proved to be beneficial to the Kig-Yar. It was difficult for the larger Covenant ships to maneuver through Y'Deio's abnormally dense asteroid belt, while Kig-Yar forces could use the asteroids for hiding. Eventually, peace was reached between the Kig-Yar and Covenant. The Kig-Yar joined the Covenant, essentially as mercenaries, and earned commissions from the Ministry of Tranquility to engage in the services of the Covenant. The Unggoy were easily inducted into the Covenant as a labourer race in 2142. In 2462, the Unggoy Rebellion began after the Ministry of Concert refused to punish Kig-Yar shipmasters that were rendering Unggoy populations infertile as petty revenge for the displacement of Kig-Yar nests. The Unggoy proved to be vicious, determined and competent fighters and an Arbiter was ultimately needed to quell the rebellion. This Arbiter ordered the glassing of Balaho, and in response the rebellion ended before much damage could be done, leaving the planet's surface intact for the most part. The Sangheili integrated the Unggoy into formerly Sangheili-only units and armed them with Covenant weaponry. The Jiralhanae were fighting a civil war on their homeworld when they were discovered in 2492. While some gladly joined the Covenant, others were unwilling at first. Nonetheless, they were quickly defeated and absorbed into the Covenant. In between the Ages of Conversion and Ages of Doubt, members of the Covenant grappled with internecine conflict. — The Covenant's first transmission to humanity, after the glassing of Harvest. During the 23rd Age of Doubt, the Covenant encountered humanity for the first time on the planet Harvest. While many within the Covenant's leadership felt that this new race would make a welcome addition to the hegemony, the newly-appointed Hierarchs of the Covenant—Truth, Mercy, and Regret—had other plans. The Hierarchs were aware of humanity's status as the Forerunners' chosen inheritors, and knew that revealing this information to the Covenant would lead to the Covenant falling into chaos. Greater than the cultural significance of the invalidation of the Great Journey, the leading San'Shyuum knew the truth about the Forerunners would lead to the loss of their personal power. As a result, spurred on by a violent incident following the first human-Covenant contact, the Hierarchs declared humanity an affront to the gods and demanded that their entire species was to be exterminated. This decision would spark a war that ultimately would crumble the very foundation of the Covenant's religious and political alliances. An invading Covenant fleet prepares its assault of a human colony. The Covenant began a genocidal campaign against humanity, seeking out their worlds one by one and wiping them clean of all life. If the colony was especially important, they would scorch the planet's entire surface and mark it with a glyph of their religion, in a process known as glassing. The United Nations Space Command was able to slow the Covenant's progress through the Cole Protocol, and by launching major offensive strikes at key military locations, as such with Operation: TORPEDO, albeit with great sacrifices. With the execution of the Cole Protocol, the UNSC also managed to prevent the Covenant from locating the human homeworld, Earth, and other important Inner Colonies for over twenty years. After decades of struggle, some Sangheili within the Covenant began to question why humanity was not offered a chance to join the Covenant as other races had. Despite their losses, humanity proved a determined and brave enemy. They were especially troubled by their soldiers called Spartans, who were more than a match for them in battles and often killed thousands of Covenant by themselves. While these idle heresies did not halt the Covenant's military progress, doubt began to surface as to the wisdom of the Prophets' ultimate goals; a doubt that was carefully observed by the spies of the Hierarchs. Notably, a major break-off faction known as the Banished was created by Jiralhanae Chieftain Atriox as a result of his disgruntlement with the Prophets' rule, and proceeded to persistently raid Covenant supplies for years while the Human-Covenant War raged on. After the massive, one month-long battle with heavy casualties for both sides, the Covenant delivered a serious blow to the UNSC as they suffered crippling military losses in a campaign known as the Fall of Reach, and also, the Battle of Tribute. After the UNSC stronghold Reach fell to the Covenant, they made a discovery of tremendous significance: a single UNSC vessel, the Pillar of Autumn, had made a supposedly blind jump away from the battle, inadvertently leading the pursuing Covenant fleet to the location of one of the seven Halo rings. The Covenant's celebration following the discovery of this prized relic was short-lived, however, as after landing on the ring Covenant soldiers accidentally released the dormant Flood. A small group of UNSC forces—among them the fearsome, enigmatic soldier known to Covenant forces as "the Demon"—managed to destroy the ring by detonating the Pillar of Autumn's fusion engines. Thel 'Vadamee, the Supreme Commander of the fleet present at Halo, was branded a heretic for his failure to save the ring, although he was subsequently appointed an Arbiter. The UNSC Pillar of Autumn flees as Reach is orbitally bombarded. Shortly after the destruction of the first Halo ring, the High Prophet of Regret accidentally stumbled upon the human homeworld, Earth, while looking for evidence of Forerunner artifacts. Ill-equipped for a full-scale invasion, Regret managed to launch a brief assault on the African city of New Mombasa before his assault carrier escaped by making an in-atmosphere slipspace jump. Whether blind or intentional, this jump led the Prophet of Regret and the pursuing UNSC frigate In Amber Clad to a second Halo ring. A brief military conflict between UNSC and Covenant forces ensued, during which time Regret met his end at the hands of the Demon. The ring itself was nearly activated, but was stopped by UNSC forces. During the events on the second Halo, the two remaining Hierarchs used the Sangheili's failure to safeguard Regret as an opportunity to replace the Sangheili with Jiralhanae as their protectors and military leaders. The two Prophets had doubts about the Sangheili's loyalty to the Covenant cause, and used the opportunity to ensure that there would be no future dissidence in the Covenant. However, this move greatly angered the Sangheili, who threatened to resign from the High Council. Covenant Sangheili and Jiralhanae battle each other upon the onset of the Great Schism. Following the death of the Prophet of Regret, the Prophet of Truth gave the Jiralhanae command over the Covenant's fleets. Once there were enough Jiralhanae in positions of power, Truth secretly ordered them to commit genocide on the Sangheili. The Sangheili Councilors, who had been summoned to the Control Room of Installation 05 to witness the commencement of the Great Journey, were either assassinated or imprisoned by Tartarus and his Jiralhanae. The rest of the Sangheili revolted, enlisting the help of some of the Mgalekgolo and Unggoy. While Truth had orchestrated to remove the Sangheili from power with the more easily manipulated Jiralhanae, the Prophet underestimated the speed with which his former protectors would recover from this initial attack. A massive battle ensued within High Charity and the surrounding space, beginning a civil war known as the Great Schism. While High Charity was consumed by internal conflict, another crisis struck that sealed the doom of the Covenant's holy city. The Flood-controlled UNSC frigate In Amber Clad made an unexpected slipspace jump inside the dome and crashed into one of the towers, initiating a full-scale infestation of the city. The Prophet of Mercy was killed during the Flood attack, with Truth leaving him to die while he made his own escape. The city and its millions of inhabitants were completely overrun by the infestation, becoming a massive Flood hive. This loss came at the worst possible moment in the Covenant's campaign against humanity, crippling their already exhausted and now divided forces. An alliance was made with the seceding Sangheili and humanity. However, these losses, among another factors, helped to form a tentative alliance with the Sangheili and humanity. The Arbiter Thel 'Vadam had discovered the truth about the Halo rings, and with the help of several of In Amber Clad's human crew members managed to prevent the second ring from firing and defeat the Jiralhanae forces defending it. While one group had initial conflicts over the Forerunner world of Onyx, the Sangheili under the command of Rtas 'Vadum joined with the UNSC in order to mutually defeat the Jiralhanae, Truth, and the Flood. This alliance was initially uneasy, but the two species gradually learned to cooperate as their reliance in battle increased. Truth escaped in the Forerunner Dreadnought, then used to provide power to High Charity. However, SPARTAN-117, the infamous Demon, managed to fight his way aboard the Dreadnought right before it took off. While the Covenant fleet orbiting the holy city began to do battle with each other, the Dreadnought managed to enter slipspace and retreated to Earth. The Arbiter executes the Prophet of Truth, bringing an end to the Covenant. Despite the loss of High Charity, the Prophet of Truth and his loyal Jiralhanae-led forces continued their pursuit of the Great Journey. They concentrated all of their available forces on Earth, near the former site of New Mombasa, Kenya, in order to claim the Forerunner artifact that the Prophet of Regret was originally looking for: the Portal at Voi to the Ark. Truth arrived in his Dreadnought and landed in the middle of the portal that his ships had uncovered, preparing for the moment of ascension to the next step. While the UNSC managed to inflict casualties upon Truth's fleet and the Covenant forces on the ground, it was not long until the UNSC forces on Earth were almost completely exhausted. Despite the UNSC's attempts to stop him, Truth successfully activated the portal and the Dreadnought retreated through, accompanied by the remaining loyalist fleet. Momentarily delayed by a small-scale Flood infestation on Earth, the UNSC and their defected Sangheili allies followed Truth's fleet through the portal to the Ark, intent on stopping Truth from activating the Halo Array. Upon arrival at the Ark, Truth barricaded himself inside the Citadel, the control center for the Halo rings, and prepared to initiate the Great Journey. However, the UNSC and Sangheili forces eventually broke through the defenses around the Citadel despite heavy resistance from the Covenant loyalist forces. Ignoring the arrival of the Flood-infected High Charity which immediately began a widespread infestation of the Ark's surface, the UNSC-Sangheili alliance launched an immediate last-ditch assault on the Citadel. Although Truth's forces mobilized all of their available assets to prevent their enemies from reaching the Citadel, they were defeated after a swift battle. SPARTAN-117 and Arbiter Thel 'Vadam formed a temporary alliance with the Flood and forced their way to Truth. In his final moments, the Prophet of Truth managed to initiate the Halo rings' activation sequence, although his victory was short-lived as John-117 and the Arbiter soon made their way to his location. The Spartan canceled the activation before the rings could fire and the Arbiter killed Truth in vengeance, finally stopping the Covenant once and for all. Thel 'Vadam and Lord Hood shake hands, marking the end of the war and an alliance of humans with Sangheili. With the Prophet of Truth killed, and most of the loyalists' known fleet destroyed by the Sangheili fleet above the Ark, the Covenant as an entity was all but destroyed. Following Truth's death at the hands of the Arbiter, the remaining San'Shyuum, their population reduced to near extinction, went into hiding and have not been sighted by the Sangheili since. The rest of the former member races scattered. While Thel 'Vadam succeeded in forming a new government known as the Swords of Sanghelios based on their homeworld, the Sangheili, having renounced the Great Journey, began to fight amongst their own ranks over the particulars of their faith, some forming their own splinter factions. Most of the Jiralhanae continued to oppose the Sangheili until at least 2559, although some Jiralhanae chose to serve under their former masters. Many Kig-Yar returned to their ancient ways as raiders and traders, and most Huragok were thought to have fled, though no one knew where. Many members of the former Covenant also sought asylum on Earth, most notably in the city of Rio de Janeiro. In the wake of the dissolution of the Covenant, many individual commanders sought to seize control of the hegemony's former military assets for themselves, many of them forming disparate fiefdoms claiming to be the Covenant. Others retreated from active involvement in interstellar affairs, maintaining the ships and weaponry for defense of their own lands. With large portions of the Covenant's infrastructure in shambles, intact ships in particular were considered a valuable commodity among the Sangheili. While many former members of the hegemony discarded the Covenant's religion in favor of more pragmatic pursuits, others continued to adhere to the core tenets of their former religion, namely the worship of the Forerunners as gods. The Banished amassed a considerable degree of power in the aftermath of the Covenant's destruction. Thel 'Vadam on trial at the High Council Chamber. For the majority of its existence, the two ruling classes of the Covenant were the San'Shyuum and the Sangheili, though the former held greater sway over the Covenant due to their status as "the voice of the gods". On the outbreak of the Great Schism, the Sangheili were cast out and the Jiralhanae replaced the Sangheili as the secondary ruling class. The Covenant had ten echelons of government, the highest echelon being the High Council, which was responsible for making all important decisions. Prior to the Great Schism, it was made up of over two hundred members of Sangheili commanders and San'Shyuum ministers, and was ruled by the three San'Shyuum Hierarchs. These Hierarchs were the highest political and religious authority in the Covenant. For each new Age, three new Hierarchs were appointed; in order for them to usher in a new age and assume power, they must receive a blessing from the Oracle of High Charity. This Oracle was a Forerunner artificial intelligence found within the Dreadnought which sat at the center of the capital. Until the events that led to the war against humanity, the Oracle had not spoken for over a millennia, so the ascension of the Hierarchs was steeped with political bribes, blackmail and manipulation of the San'Shyuum Philologist. The High Council consisted of San'Shyuum and Sangheili High Councilors, who were extremely important to the Covenant society. The High Council served as the central theocratic and decision-making body of the Covenant. In addition to the High Council, there are three other Councils: the Council of Concordance, the Council of Deed and Doctrine, and the Council of Masters. The Council of Concordance was responsible for the creation of the Ratification Parley and Writ of Union. The Council of Masters was a controlling group within a Covenant fleet that dictated the needs of fleet and military forces. Below the councils, numerous ministries exist within the Covenant government, each of which dictates a single, but important role within the governmental body of the Covenant. Each ministry was led by a San'Shyuum minister. A ministry's vice minister served as an aid for the minister, while numerous senior and junior staffers served under both individuals. In truth, however, the San'Shyuum and Sangheili had an uneasy coexistence, and political infighting was very common behind the scenes. This stemmed from as far back as the Writ of Union, when the Sangheili begrudgingly accepted the alliance with the San'Shyuum, despite many Sangheili innately knowing the treaty technically meant their species' surrender to the Prophets. Over the Covenant's history, high-ranked San'Shyuum manipulated the Sangheili and sought to keep them without strong leaders of their own in order to keep them subservient to the Prophets' rule. The most prominent example of this is the San'Shyuum's perversion of the traditional Sangheili title of Arbiter from a position of great power and honor into a badge of shame, and a means by which to silence those they felt might challenge the Hierarchs' power. In other cases where appointing an Arbiter may have been inconvenient, Sangheili commanders deemed to wield too much influence with their kind were quietly exiled to the fringe worlds of the Covenant empire; an example of this was the fate of Imperial Admiral Xytan 'Jar Wattinree. The hidden distrust between the two species became an all-out war during the Great Schism. The Great Journey's objective was to find and activate the Halo rings, and so ascend to godhood. Covenant society had a distinct caste-based societal system with a strong theocratic underpinning. In the Covenant caste system, one's position in the hierarchy was dictated largely by their species. With the San'Shyuum and Sangheili leading the Covenant's religiopolitical and military affairs, respectively, most of the other species served either as warriors or manual labor. The Covenant's culture and religion was based solely on the worship and reverence of the Forerunners. Long ago, the San'Shyuum managed to decipher some of the data stored on terminals aboard the Forerunner Dreadnought, thanks to the Forerunners' robust translation systems. However, even then they were unable to fully comprehend the subtle meanings of many Forerunner glyphs. The San'Shyuum incorrectly interpreted the activation of the Halo Array as a means of transcending mortality, a process they came to call the "Great Journey". They did not understand that the Array had been designed to eradicate the Flood, specifically by triggering a galactic holocaust and killing all sentient life within the galaxy. They arrived at the conclusion that the Forerunners had ascended to godhood and left other species of the galaxy to their fates. Because of this, the Covenant devoted itself to searching for and recovering of Forerunner artifacts. At several points in the Covenant's history, this desire to reclaim Forerunner technology has resulted in the hegemony declaring war against non-compliant species, the most recent instance being their war against humanity. In Covenant society, personal vendettas are not tolerated, although many conflicts in the Covenant's past have been sparked by vendettas. Kig-Yar and Unggoy listening to the sermons of a Prophet. The Covenant used commerce as a form of economy. As the Covenant's cohesion was grounded in its belief of working to obtain and sharing Forerunner technology, every member of the Covenant was given a form of employment or a service to fulfill in exchange for goods and necessities. In the Covenant's culture, service for salvation was the moral motivation for the entire population. Despite this, there was discrimination within the Covenant: The lesser species were treated as second-class citizens with little political or representative voice or power. The Covenant were always eager to add new species to the faith, so long as they pledged allegiance to the San'Shyuum as their supreme leaders and the Great Journey as their religion. Client races were in all essence enslaved by the Covenant, forced to live a completely different way of life, and if unlucky enough, had their entire culture and history erased. The client races were held together by a common belief; the slave races were driven by the religion which they had been forced to accept. Most races were only kept for their varying skills to be exploited, rather than to be a part of a flourishing empire. However, some races such as the Sangheili and Jiralhanae benefited significantly from the new technology that the Covenant brought, and weren't simply enslaved like the Unggoy. The Covenant is made up of a variety of alien species from different parts of the galaxy. Organized into a caste system by the San'Shyuum, the different species of the Covenant are united by their blind faith in the promise of the Great Journey. In addition to the core member species listed below, there are a number of peripheral client species—known collectively as the Covenant fringe—that were never fully integrated into the Covenant, though some provided various advantages to the hegemony. However, not every species encountered by the Covenant was deemed worthy of even providing them with conversion in exchange for services, though their worlds still fell under Covenant control. These species were poorly documented by the Sangheili and have not been contacted nor cataloged by the Unified Earth Government, even after the Covenant's fall. The highest political caste in the Covenant, the San'Shyuum, or "Prophets" as they are known by humans, led the Covenant and exerted complete control over all religious and political affairs. Though physically weak, Prophets wielded power through absolute command of the Covenant and through scavenged Forerunner technology, leaving the task of conquest to the Sangheili and the other races. Along with the Sangheili, the San'Shyuum had members on the Covenant High Council. The Sangheili, or "Elites" as they are known by humans, served as the military leaders of the Covenant before the Great Schism. Along with the San'Shyuum, the Sangheili were one of the two founding races of the Covenant, and were the only race other than the San'Shyuum to have members on the High Council. The Sangheili are the only race within the Covenant permitted to build and command starships within the Covenant, though the crews are always composed of a mix of races. The Jiralhanae, or "Brutes" as they are known by humans, were the most recent addition to the Covenant, and served as soldiers and bodyguards within the Covenant military until their promotion during the Great Schism. Although initially of low status within the hierarchy, the Jiralhanae gained greater prominence within the Covenant prior to the Great Schism, with the Chieftain of the Jiralhanae, Tartarus, answering to the Hierarchs themselves. After the Sangheili were deposed, the Jiralhanae were given command of the Covenant military. The Lekgolo are a race of worm-like creatures that can combine to form large, intelligent assemblages called Mgalekgolo, known by humans as "Hunters". Clad in nearly impenetrable armor and armed with their trademark Assault Cannon, they served as the Covenant's heaviest ground troops. Many of these creatures joined the Sangheili during the Great Schism. Hailing from Balaho, the Unggoy, or "Grunts" as they are known by humans, were the most common and low-ranking caste of the Covenant. They breathe methane gas, and thus must wear a large tank on their back full of methane to survive on other planets. Relations between the Unggoy and the Kig-Yar are strained in the best of times. Many of these creatures joined the Sangheili and the Jiralhanae during the Great Schism. The Kig-Yar, or "Jackals" or "Skirmishers" as they are known by humans, were the scouts and marksmen of the Covenant military due to their superior senses. They were among the lower Covenant castes and are about 6'2" tall. The Yanme'e, or "Drones" as they are known by humans, are flying, insectoid species that served almost exclusively as engineers in the Covenant Empire. They were eventually replaced by the Huragok, and were used as aerial combatants against the UNSC, who are inexperienced at fighting airborne infantry. The Huragok, or "Engineers" as they are known by the humans, are an artificial species created by the Forerunners. They only conversed with the San'Shyuum or individuals who learn their language. The Huragok performed the physical labor of excavating and gathering data on Forerunner artifacts. In military terms, they were generally a non-militant race. Many of the Huragok joined the Sangheili during the Great Schism. The Fleet of Sacred Consecration, made up of CAS-class assault carriers and CCS-class battlecruisers. The Covenant maintained pervasive armed forces to enforce order, conduct atmospheric and space combat operations, and generally carry out the Covenant's will throughout space. Unlike the UNSC, however, the Covenant lacked a single unified military arm, and its armed forces were instead comprised of several organizations overseen by various ministerial bodies. The Covenant's military capability was most overtly embodied in its spaceborne fleets, ranging from small battle groups to entire armadas. Various task-based groups served under these fleets, including the occupational ground forces and the Special Warfare Group, which contained the Special Operations Division. Covenant troops were heavily segregated by species, with the Sangheili originally serving as their leadership caste. In the field, Unggoy were deployed as cannon fodder files, Kig-Yar were used as support and snipers, and Sangheili were commanders and fought in warrior lances. Weapons and technology were restricted by species and rank; only Sangheili received personal energy shields and energy swords, only Kig-Yar received point defense gauntlets, and Unggoy only received basic weapons and armor depending by rank. The reasons for these restrictions were often cultural; for instance, Sangheili viewed wielding shield gauntlets as dishonorable and that "lesser species" did not deserve their privileged weapons. This discrimination among the Covenant military was centuries old, but the dynamic was occasionally changed by violent rebellion. The Unggoy Rebellion caused Sangheili to mix their units with Unggoy and give them better training. Likewise, the Great Schism put Jiralhanae in command of former Sangheili units, gave them personal shielded armor, and made their tribal packs a prominent military unit. Energy shielding and active camouflage were reverse-engineered from Forerunner technology. Covenant technology has been often described as more imitative rather than innovative, as they are based largely on mimicry and reverse-engineering of the leftover Forerunner artifacts they have discovered. Such examples are their exceedingly accurate slipspace navigation, near-instantaneous interstellar communication, the manipulation of extremely high volumes of plasma energy from sublight travel, short-range translocation of matter, a great influence over gravity and repulsor-based technologies, and man-portable application of energy manipulation. Much of the Covenant's rapid technological advancement was made by stripping Forerunner shield worlds of useful matériel early in the hegemony's existence. In the Covenant, ecclesiastical authorities ultimately oversee even the most trivial modifications to existing designs. Improvements or alterations require layers of bureaucracy to navigate, and often take decades to gain approval from the Prophets. As a result, some designs, technology and vessels have remained in service for many centuries with little alteration to their base design. Although innovation is not one of the Covenant's strong suits, the Covenant has shown considerable advancement in bridging the technological gap with newly-encountered species. For example, in the first encounter of the Human-Covenant War, the Covenant learned of the humans' computer systems and of its language from salvaging human computer and network components from destroyed human ships. This knowledge benefited the Covenant greatly in understanding the humans' military operation, to the extent that the UNSC enacted the Cole Protocol to deter the Covenant from finding human colony worlds and Earth. 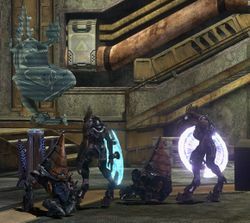 In another scenario, during the preliminary of the Fall of Reach, the Covenant crippled Reach's telecommunication network to prevent the colony world from contacting reinforcements and placed numerous teleportation spires to deploy its forces without having to face directly with the planet's orbital defenses. In Covenant culture, there are religious taboos that prevent them from fully exploring what the Forerunners employed to create that technology. In some cases, Covenant technology imitates the effects of the Forerunner technology it is based on while the underlying science remains largely beyond their grasp. An example of this is the Covenant's predominant use of plasma in their weapons rather than the more exotic hard light and particle streams utilized by the Forerunners, or the Covenant's pinch fusion reactors in contrast to the Forerunners' ability to harness vacuum energy. The Covenant also never developed advanced AI technology due to their religious doctrine; they believed that a powerful AI had once betrayed the Forerunners, and as such they had a ban on actually sapient machine intelligences. The few Covenant AIs that have been encountered include an AI that was stationed aboard the Ascendant Justice and destroyed by Cortana, one based on the Truth and Reconciliation, as well as the Seeker, sent to infiltrate UNSC systems and alert the Covenant to the location of Earth. Cortana's copy also referenced several AIs being present in the Unyielding Hierophant's systems when the Spartans infiltrated the station. The Forerunners' ubiquitous hard light technology was never completely understood by the Covenant, although they managed to develop at least one hard light-based device in the Prelates' shield gauntlets. However, they did possess advanced energy field shaping and complex holography. This technology was advanced enough to produce realistic and tangible simulacra of physical objects. The holo-drone, for example, generates an independent decoy of the operator capable of inflicting physical harm on the enemy despite its incorporeal nature; the T-27 holographic decoy is a more basic variation of this concept. The Covenant applied forcefield technology in a broad range of roles, from the San'Shyuum's spherical stasis fields to contain beverages such as tea to the enormous fields used to hold in High Charity's atmosphere while the holy city's exterior dome was still under construction. Covenant architecture is known for its curved, organic and sophisticated looking style, primarily based on the aesthetic tastes of the San'Shyuum with loose connections with Sangheili designs. Even military vehicles were fashioned after San'Shyuum aesthetics early on, incorporating many of the Sangheili designs over the Covenant's history. Constructed of distinctive purple, blue or white metal, these colors are the main focus of Covenant design and distributed throughout their starships, vehicles, and weapons. The materials they use are unknown to the UNSC but are very strong and resilient. The Covenant possess a variety of medical technologies, including the life-extension treatments the San'Shyuum have used for some time. The San'Shyuum Prelates were also know to have used a form of biological augmentation to greatly enhance their normally frail bodies. As an idiosyncrasy of their warrior culture, the Sangheili view the notion of doctors as dishonorable. However, as injuries are an inevitable byproduct of combat, the Covenant military still employs a number of medical amenities. Among these are automated surgery suites, featured on Covenant ships to treat wounds received in combat, and magnetic splints which are used to hold broken bones in place. The Huragok (both the common Builder kind and the Lifeworker variation) also provided medical aid in addition to their primary role of maintaining Covenant technology. It was known that even after suffering major injuries, after only minutes of treatment the patient would feel back to normal without as much as a scar to show for it. The Resplendent Fervor separates its aft section while the bow enters slipstream space. For the Covenant species, interstellar travel was made easy due to the reverse-engineered technology. Like humans, Covenant vessels can enter Slipstream space and travel significantly faster than light. However, the Covenant equivalent of the Shaw-Fujikawa Translight Engine is far more efficient and reliable, relying on a series of "micro-jumps" to maneuver through the slipstream. Covenant vessels do not suffer the "temporal fluidity" of faster-than-light to such a degree as human vessels, arriving at the precise time and location that they intend. However, after a slipspace jump Covenant vessels generally experience a temporary power outage, leaving the vessel vulnerable to attack. As a result, Covenant battlegroups are much more efficient when acting as a coordinated group, and can strike more quickly and decisively. Covenant starships use repulsor engines for propulsion in space, rather than the more traditional fusion engines utilized by humanity or the advanced reaction drives used by Forerunners. Covenant drive systems seem to be propelled by an unusual combination of gravity "waves" and some form of highly reactive plasma displacement, but the actual means and method of propulsion is currently beyond human understanding. Both starships and ground vehicles are equipped with various forms of anti-gravity technology, allowing ships to hover easily inside an atmosphere and allowing frictionless movement of vehicles across terrain. The Covenant are also able to manipulate exceedingly large amounts of plasma energy by recycling detritus from sublight travel. Covenant manufacturing plants, such as the Assembly Forges, employ highly sophisticated manufacturing methods which allow them considerable freedom in the design of individual ships. While all Covenant vessels fall into one of several universal design patterns, every ship can be custom-made to fit the preferences of individual shipbuilders and fleet masters. Most of the Covenant arsenal consists of plasma-based directed energy weapons, but the Covenant are known to also utilize pulse lasers, particle beam weapons, antimatter explosives and even chemical crystal-based weapons. Interestingly, Covenant weapon designs seem to defy known laws of mechanics; there is typically no form of radiative, physical, or electrical contact between the firing mechanism and "trigger" of a weapon. For these and other reasons, the workings of Covenant weaponry is generally beyond the comprehension of UNSC scientists. The Covenant favor plasma weapons, used for both their starships and ground forces. Plasma weapons typically use a rechargeable power cell to provide power to their internal components. Covenant plasma weapons are effective but crude, and most automatic-fire plasma weapons are prone to overheating. To compensate, most weapons have vents that open to discharge excess heat and plasma when they overheat, although such weapons are rendered inoperable as the excess heat is dissipated. Once the energy of the plasma weapon is depleted, it must be recharged or discarded. To date, the means by which plasma weapons can be recharged is still unknown to UNSC forces. The most remarkable handheld plasma projectile weapons are a variety of plasma pistol (by far the most widely used small arm) and the plasma rifle. Notable vehicular plasma weapons include various cannons and mortars, while warships are armed primarily with plasma torpedo turrets. Though rarer, the Covenant occasionally use projectile weapons, the most common of these being unconventional crystal-based weapons such as the Type-33 Needler and the Type-31 needle rifle. These weapons appear to use some type of chemical that forms a hard, razor-sharp crystal on contact with the atmosphere; the material is mined on Suban, one of Sanghelios' moons. Certain medium- to long-range weapons fire these crystals at high speeds, allowing them to strike targets accurately at long distance. Other mid-range weapons fire them at very slow speeds, and through unknown means "steer" them towards enemy targets. Needles fired in either of these ways will penetrate the flesh or armor of a target, and several seconds after coming to rest will explode into thousands of tiny, sharp fragments that can maim or cripple a target. When a certain number of needles have penetrated the same target, they will detonate simultaneously, producing a much larger explosion that kills the target instantly. With the introduction of the Jiralhanae as a major military caste within the Covenant, their weapons found widespread use among their own kind. Utilizing crude, spike-like metal projectiles in place of plasma; conventional explosives and incendiaries; and sharp blades, they are more primitive, yet in many cases more dangerous -fitting, considering the nature of their creators. Brute weapons include the Spiker carbine, the Mauler shotgun-pistol, and the Brute Shot grenade launcher. The Covenant employ melee weapons in addition to their already fearsome arsenal. 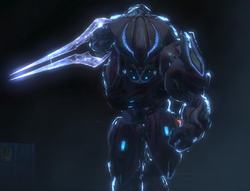 The best known is the energy sword, used solely by the Sangheili. Creating a double blade of superheated plasma, it has both ceremonial and martial value to Sangheili warriors and its possession is closely monitored. Another is the Jiralhanae gravity hammer, which seems to be the Brutes' cultural equivalent to the energy sword. However, rather than using a blade of plasma, it generates a gravitational field which can cause tremendous damage within a several-meter radius. Covenant vehicles use advanced anti-gravity technology for propulsion, and are armed with directed-energy weaponry of varying potency. Though often faster than their UNSC counterparts, Covenant vehicles are more unstable over uneven terrain where the sudden changes affect handling. All Covenant vehicles (except for Jiralhanae vehicles) and structures are made from a purple or dark blue type of metal, said to be much more advanced than any alloy known to humans, and all Covenant vehicles are nicknamed after some kind of supernatural entity by the UNSC, except for Excavators. Recently, Jiralhanae vehicles and technology have been incorporated into the Covenant's arsenal. Though more primitive, they serve the Jiralhanae's need for power. Jiralhanae vehicles are not named after spiritual entities, and rather than being a series of Covenant vehicles are regarded as native Jiralhanae technology. The Covenant's expansive interstellar empire was based within the Orion Arm of the Milky Way galaxy,[note 1] with the mobile holy city High Charity as their capital. At the height of its power, the Covenant encompassed thousands of systems. Befitting its vastness, the governance of the Covenant's interstellar dominion was highly complex; occasionally worlds or entire sub-domains vanished from the records maintained at High Charity, only for contact to be re-established decades later. The High Council was responsible for the administration of these interstellar territories, assigning tithes and levies, and allocating resources across the numerous member worlds. San'Shyuum governors handled administrative duties on a local scale; most of them joined the rest of the species on their mass exodus during the Great Schism. Some species, such as the Kig-Yar and Lekgolo, had created colonies of their own before their incorporation into the Covenant. These worlds would be absorbed into the empire after the species joined the Covenant. Covenant space would grow to include new worlds as the hegemony expanded throughout the spiral arm, and even Forerunner installations were settled by the Covenant. Despite the massive size of the empire, the Covenant would generally leave a newly discovered world untouched, unless the world held religious or practical significance. Base worlds established by the Sangheili were considered the Covenant's primary worlds. Since the incorporation of the Jiralhanae, the San'Shyuum settled them on resource-rich worlds to guard them from anyone seeking to claim them for themselves, although the Jiralhanae lacked the ability to mine the resources themselves. After the dissolution of the Covenant and the exodus of the local San'Shyuum governors, many of the Covenant's colonies fell under the control of the hegemony's various splinter factions, while others were claimed by unaffiliated members of the Covenant client species, especially the Sangheili or Kig-Yar. Some worlds were contested between species and governments, while Joint Occupation Zones were established between the Unified Earth Government and the Swords of Sanghelios to allow colonies to be administrated by multiple species. French Les Covenants in most media. L'Alliance Covenante in most media. Le Covenant in Halo Legends. Covenant is a major city in Bungie's Myth series; it is home to the Total Codex, a magical book that lists the fate of every being that will ever be born. Bungie later considered Covenant as a potential title for Halo: Combat Evolved. Paul Russel joked that it "... sound[ed] like a bad 80's hair band." The Biblical Ark of the Covenant represented the will of God, in connection with the quote: "Your destruction is the will of the Gods...and we are their instrument." This references the Covenant's belief they carry through the will of their gods, the Forerunners. A symbol used on some of the Covenant's vehicles. The emblem used to identify the Covenant faction in Halo Wars, fashioned after a Hierarch's headdress. A hologram of multiple Covenant species in Halo: Fall of Reach. The Sangheili scripture for the word Covenant. First seen in a Halo: Fleet Battles promo and later in Sunaion. The image is a Photoshop recreation. The Sangheili scripture for the word Covenant. First seen in Sunaion. Notice that it is a mirrored version of the previous image. The image is a Photoshop recreation. A representation of a Covenant Fleet, created by Spartan Games. The Sangheili sigils for the Covenant on a replica of the CCS-class battlecruiser Truth and Reconciliation. Sangheili and San'Shyuum during the early days of the Covenant in Halo Mythos. ↑ The Halo Waypoint article for the Covenant claims that the empire "dominated much of the galaxy". However, most sources (including Halo: Warfleet and several Waypoint articles) agree that the Covenant Empire was based out in the Orion Arm. ↑ Halo 3 - The Covenant (level) - The Covenant was defeated on the Ark during the Battle of Installation 00. ↑ Halo Wars 2 GAMEPLAY - E3 2016 Interview (Interview with Kevin Grace) - "The Covenant are dead"
↑ Canon Fodder - "The resulting conflict would be called the Great Schism, and it would divide the Covenant into two, ultimately forcing the Sangheili out." ↑ Halo Waypoint: 'Canon Fodder' - Lore of the Rings - "Like the rest of the Sangheili, the surviving Councilors were not completely unified in their opinions on how to proceed following the Great Schism. While some did take up the Arbiter’s cause, many others had become enamored with the idea of bringing the Covenant empire under complete Sangheili rule, quickly scrambling to grab power wherever they could. Some of these eventually served under Jul ‘Mdama, while others consolidated small pockets of reclaimed Covenant assets under more independent factions." ↑ Halo: Shadow of Intent, page ? ?